Histone deacetylase inhibitors (HDACIs) induce hyperacetylation of core histones modulating chromatin structure and affecting gene expression. These compounds are also able to induce growth arrest, cell differentiation, and apoptotic cell death of tumor cells in vitro as well as in vivo. Even though several genes modulated by HDAC inhibition have been identified, those genes clearly responsible for the biological effects of these drugs have remained elusive. We investigated the pharmacological effect of the HDACI and potential anti-cancer agent Trichostatin A (TSA) on primary T cells. To ascertain the effect of TSA on resting and activated T cells we used a model system where an enriched cell population consisting of primary T-cells was stimulated in vitro with immobilized anti-CD3/anti-CD28 antibodies whilst exposed to pharmacological concentrations of Trichostatin A. We found that this drug causes a rapid decline in cytokine expression, accumulation of cells in the G1 phase of the cell cycle, and induces apoptotic cell death. The mitochondrial respiratory chain (MRC) plays a critical role in the apoptotic response to TSA, as dissipation of mitochondrial membrane potential and reactive oxygen species (ROS) scavengers block TSA-induced T-cell death. Treatment of T cells with TSA results in the altered expression of a subset of genes involved in T cell responses, as assessed by microarray gene expression profiling. We also observed up- as well as down-regulation of various costimulatory/adhesion molecules, such as CD28 and CD154, important for T-cell function. Taken together, our findings indicate that HDAC inhibitors have an immunomodulatory potential that may contribute to the potency and specificity of these antineoplastic compounds and might be useful in the treatment of autoimmune disorders. Localized changes in chromatin structure are a key event in the transcriptional regulation of genes . Nucleosomes, the basic units of chromatin, consist of an octamer of core histones (H2A, H2B, H3, and H4) wrapping 1.8 turns of DNA, and form a compact and hierarchical structure. Histone tails are subject to multiple posttranslational modifications such as acetylation, phosphorylation, ubiquitination, methylation, and poly-ADP-ribosylation, which play a role in transcriptional regulation [2–4]. Reversible acetylation of the ε-amino group of lysine in the histone tails by histone acetylases (HATs)/histone deacetylases (HDACs) is one of the best-studied posttranslational modifications of histones, correlating with transcriptional activation/repression. Thus, hyperacetylated histones are generally associated with transcriptional permissiveness whereas hypoacetylated histones mediate gene repression. HDACs were found to be associated with co-repressors [5–8] and as a consequence most studies to date have focused on their role in transcriptional repression. However, inhibitors of HDAC activity (HDACIs) that increase histone acetylation by preventing deacetylation, induce up- as well as down-regulation of a small subset of genes [9–11], suggesting that chromatin structure modulation by HDACs is a gene-specific event with a variable transcriptional outcome, and that only a few genes (approximately 2%) are regulated primarily through HDAC-dependent mechanisms. Known compounds that inhibit HDAC activity include sodium butyrate, phenylbutyrate, trichostatin A (TSA), suberoylanilide hydroxamic acid (SAHA), trapoxin (TPX), MS-27–275, apicidin, oxamflatin, and FR901228 (for an overview see ). These agents are known to cause a variety of effects in cell cultures including cell growth inhibition, cell differentiation and apoptotic cell death, and to inhibit the growth of cancer cells in animal models [13–18]. Furthermore, therapeutic applications of HDACIs have shown great promise in clinical studies. Some HDACIs have also been shown to alter expression of genes involved in immune processes, such as cytokines (IL-2 , IL-8 , IFNγ and IL-10 ), and costimulatory/adhesion molecules (CD154 , MHC class II , and CD86 ). T cells are activated physiologically by triggering of the T-cell receptor-CD3 complex. There is evidence that the induction of cytokine synthesis and proliferation by T cell receptor (TCR)-mediated activation requires costimulatory signals that can be provided by additional cell surface molecules. Utilizing primary CD4+ T cells, we assessed the physiological effects of TSA on lymphocytes. We demonstrate that various cellular functions, such as proliferation and cytokine production, were inhibited when T cells were exposed to TSA. Moreover, expression of a subset of genes involved in T cell responses, including a variety of costimulatory/adhesion molecules, was reduced in cells treated with TSA. Thus, histone deacetylase inhibitors possess not only anti-cancer activity but can also function as immunomodulators. All cells were cultured in RPMI-1460 medium (BioWhittaker, Walkersville, MD) supplemented with 2 mM L-glutamine, 0.01 M HEPES, 1 mM NaHCO3, 1 mM sodium pyruvate, 10% fetal bovine serum (FBS), 0.1 mg/ml gentamicin sulfate, and 50 μM β-mercaptoethanol (Sigma-Aldrich). CD4+ T cells were isolated from erythrocyte-depleted spleen cell preparations from C57BL/6 mice by positive selection using magnetic microbeads coated with anti-CD4 mAb according to manufacturer's instructions (Miltenyi Biotec, Sunnyvale, CA). Naive CD4+ CD62L+ CD44low T cells were prepared using a negative selection kit according to manufacturer's instructions (Mouse Naive T Cell CD4+/CD62L+/CD44low Column Kit; R&D Systems Inc., Minneapolis, USA). For cultures containing TSA, concentrated solutions (10 × concentration) were freshly prepared in RPMI from frozen stocks (10 mM TSA in DMSO), whenever required, and diluted into cell suspensions to the desired concentrations. Female C57BL/6 mice were purchased from Bomholtgaard Ltd. (Ry, Denmark). All animals were allowed to acclimatize to the local environment for at least 1 week before being used for any experiment, by which time they were 8–10 weeks old. Animals were housed under pathogen-free conditions and all experiments were conducted in accordance with national guidelines. CD28 forward and reverse primers 5'-GCTGTTCTTGGCTCTCAACT-3' and 5'-TCGAGCGAAACTGGGGCTGA-3', respectively; MetAP2 forward and reverse primers 5'-TTCGGTACCCTTGCCTTCTG-3' and 5'-TTAATAGTCATCTCCTCTGC-3', respectively; p27 forward and reverse primers 5'-ATGTCAAACGTGCGAGTGTC-3' and 5'-TTACGTTTGACGTCTTCTGAG-3', respectively; GATA-2 forward and reverse primers 5'-ACTATGGCAGCAGTCTCTTCCATC-3' and 5'-AAGGTGGTGGTTGTCGTCTGAC-3', respectively; p21 forward and reverse primers 5'-GATGTCCGTCAGAACCCATG-3' and 5'-TTAGGGCTTCCTCTTGGAGA-3', respectively; NUR77 forward and reverse primers 5'-GTTGATGTTCCCGCCTTTGCC-3' and 5'-TCAGAAAGACAATGTGTCCAT-3', respectively; LAT forward and reverse primers 5'-AGGATGAAGACGACTATCCC-3' and 5'-TTCACACGACTCCACAGAGA-3', respectively; p16 forward and reverse primers 5'-GATGGGCAACGTTCACGTAG-3' and 5-CGGAACACAAAGAGCACCCA-3', respectively; IL-2 forward and reverse primers 5'-GAATGGAATTAATAATTACAAGAATCCC-3' and 5'-TGTTTCAGATCCCTTTAGTTCCAG-3', respectively. Primers specific for 18S RNA-QuantumRNA™ Classic 18S Internal Standard- were purchased from Ambion (Ambion, Austin, TX). Gene expression analysis was performed using Clontech's Atlas™ expression arrays (mouse 1.2 and 1.2 II) in accordance with the manufacturer's instructions. Briefly, in two independent preparations 50 μg of total RNA were isolated from CD4+ T cells grown under treated and non-treated conditions, using Atlas™ Pure Total RNA labelling system (Clontech) and polyA+ RNA purified and retrotranscribed in the presence of [α-32P]dATP. Labelled cDNAs were hybridized overnight to paired membranes (2 membranes per assay) under stringent conditions. Membranes were extensively washed and subsequently analysed on a Fuji BAS 2500 Image Analysis System (FUJIFILM Medical Systems, Stamford, CT, USA). A complete list of the genes present in the used arrays and a full instructions manual can be found at http://www.clontech.com/atlas/genelists/index.shtml. Latex beads (Interfacial Dynamics Corp., Portland, OR) were coated with antibodies specific for CD3, CD3/CD28, or hamster IgG (isotype control) as described . For determination of IL-2 production, 1 × 105 CD4+ cells were cultured in round-bottom 96-well plates (Nunc, Roskilde, Denmark) under the conditions of the specific assay. Subsequently, the supernatant was removed for analysis and the cells were washed, fixed, and permeabilized for intracellular staining and analysis by FACS using Cytofix/Cytoperm Plus kit as per manufacturer's instructions (Pharmingen). Levels of IL-2 in the supernatant were quantified by a sandwich enzyme-linked immunosorbent assay using specific antibody pairs from Pharmingen (JES6-1A12 and JES6-5H4) and recombinant murine interleukin-2 (rmIL-2; Roche Molecular Biochemicals) as standard. Flow cytometric analysis of cell surface molecules was performed by incubating 1 × 105 cells with isotype-matched control antibody or a relevant antibody at 4°C for 30 minutes. Phycoerythrin (PE) and fluorescein isothiocyanate (FITC) conjugated as well as non-conjugated antibodies were purchased from Pharmingen. After washing twice with phosphate-buffered saline (PBS) supplemented with 2% FBS, the cells were analysed on a FACSCalibur flow cytometer (Becton Dickinson, San Jose, CA) equipped with CellQuest software. Samples incubated with isotype-matched control antibodies were used as reference for the placement of logic quadrants and gates. 5-carboxyfluorescein diacetate succinimidyl ester (CFSE)-staining was performed according to manufacturer's instructions (Molecular Probes, OR). ROS production upon treatment with TSA was assessed by oxidation of the dyes 2',7'-dichlorodihydrofluorescein diacetate (DCFDA; Molecular Probes) and dihydroethidium (DHE; Molecular Probes, OR) to the fluorescent products 2',7'-dichlorofluorescein (DCF) and ethidium (Eth), respectively, as measured by flow cytometry. DHE and DCFDA were added to cultures at a final concentration of 2 μM 15 min before harvest. The incubation was terminated by 10-fold dilution with ice-cold PBS buffer before the cells were washed and submitted to FACS analysis. For detection of apoptosis, approximately 104 cells were collected, stained with Annexin V: FITC Apoptosis Detection Kit I according to manufacturer's instructions (Pharmingen) and analysed by FACS. For cell cycle analysis, 2–3 × 104 cells were collected in DNA staining solution (0.1% sodium citrate, 0.3% NP-40, 0.02 mg RNase A per ml, 0.05 mg of propidium iodide per ml) and incubated for 30 min. DNA content was subsequently analysed by FACS. In both cases FACS analysis was performed on a FACSCalibur flow cytometer equipped with CellQuest software. Crude cell extracts for Western blotting (nuclear+cytoplasmic) were prepared from approximately 1 × 106 cells using the NE-PER® Nuclear and Cytoplasmic Extraction Reagen Kit (Pierce, Rockford, IL), according to the manufacturer's protocol. Extracts were resolved on NuPAGE 4–12% gels (Invitrogen, Carlsbad, CA), blotted onto PVDF membranes (Invitrolon, Invitrogen) and detected using Supersignal WestPico detection reagents according to manufacturer's instructions (Pierce, IL). The ability of HDACIs to cause cell growth arrest, differentiation and apoptotic cell death of cultured tumor cells is well established [10, 13–17]. However, with a few notable exceptions the majority of the studies done on the effects of HDACIs were performed using transformed or otherwise immortalized cell lines. Since cancer cells have altered levels of histone acetylation and DNA methylation, the effects caused by HDACIs in these cells probably do not completely reflect the situation in normal cells. In fact, a recent report showed that normal cells are less sensitive to HDAC inhibition than transformed counterparts . To address the question of the differential sensitivity to HDACIs of tumor cells as compared to normal cells, and to gain some insight into the pharmacological mechanism of action of these compounds in non-transformed cells, particularly in lymphocytes, we set out to characterize the effects of HDACIs on normal primary murine CD4+ T lymphocytes. CD4+ T-cells were purified from C57BL/6 spleen cells and treated for 24 hours with increasing concentrations of a specific HDAC inhibitor, Trichostatin A (TSA). As shown in Figure 1A, there was a dose-dependent reduction in cell viability. Exposure to less than 5 nmol/L TSA reduced the viability of CD4+ T-cells by approximately 50%. These findings indicate that primary CD4+ T-cells are sensitive to HDAC inhibitors at effective concentrations similar to those reported for a variety of transformed cells [12, 17, 23, 26]. TSA induces apoptosis and cell cycle arrest in CD4 + T-cells. (A) CD4+ T-cells were treated for 24 hours with increasing concentrations of TSA (■). Cell death was determined by flow cytometric analysis of DNA content by PI staining of nuclei. Error bars show SD. (B) CD4+ T-cells were treated for 8 or 20 hours with various concentrations of TSA or DMSO alone as a negative control (-TSA). Cells were subsequently stained with Annexin V and PI. Inset in the bottom right quadrant of each plot are the percentage of cells that gated to the various quadrants (UL – upper left; UR – upper right; LL – lower left; and LR – lower right). The numbers for LR correspond to cells in early apoptosis (Annexin V positive and PI negative). (C) Effect of TSA on cell cycle progression of T cells. CD4+ T-cells were incubated for 24 h in the presence of medium containing IL-2 (10 U/ml), or anti-CD3 coupled beads (2:1 beads to cells ratio) after which either TSA (final concentration of 10 nM) or DMSO alone was added. After 20 hours the cells were analysed for cell cycle distribution by flow cytometry. Data are plotted as DNA content (propidium iodide fluorescence) vs relative live cell number (cells gated to R1). The total percentages of cells in the G0/G1 (region M1), S (region M2), and G2/M (region M3) phases of the cell cycle are shown. (D) Live TSA-treated cells (20 h with 10 nM TSA) were isolated by centrifugation in Ficoll Paque, washed extensively, labelled with CFSE and incubated in the presence of anti-CD3 coated beads (2:1 bead to cell ratio). Proliferation status of T cells was evaluated after 24 h (gray shaded histogram), 72 h (black open histogram), and 8 days (open gray histogram). Arrows indicate CFSE division peaks. For simplicity dead cells were excluded from the analysis. The data are representative of three independent experiments. To ascertain if the decrease in cell viability is due to induction of apoptosis, we performed Annexin V staining of treated cells. FACS analysis of TSA-treated CD4+ T cells showed staining with Annexin V, with the number of Annexin V positive cells increasing in a time and dose-dependent manner (Figure 1B) arguing for TSA-induced apoptotic cell death of lymphocytes. Next we investigated the cell-cycle pattern of TSA-treated T cells, as TSA is known to inhibit cell proliferation and to cause cell cycle arrest in human cancer cells. 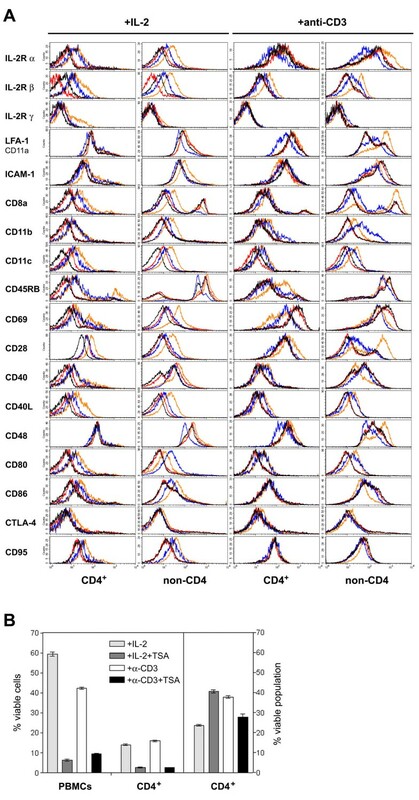 Red blood cell-depleted splenocytes from C57BL/6 were stimulated with either IL-2 or soluble anti-CD3 mAb for 24 h, after which CD4+ T cells were purified and exposed to TSA for 20 h. Cells were subsequently analyzed for their cell cycle distribution (Figure 1C). As can be seen from the DNA content profile, cells exposed to TSA that had not yet undergone apoptosis (8% and 5.3 % for IL-2 and anti-CD3 stimulated cells, respectively) accumulated in the G0/G1 phase of the cell cycle (corresponding to region M1). This cell cycle arrest is reversible as shown in Figure 1D. T cell proliferation was measured as described previously, by labeling cells with CFSE and evaluating cell divisions by the decrease in CFSE fluorescence intensity . On day 3 after removal of TSA from the medium, cells either remain undivided or have undergone one cell division. On day 8 the remaining CFSE+ cells have most proliferating cells in division peak 5 and 6, indicating that once TSA is removed, those cells that have not become apoptotic are able to proliferate for at least 6 cell divisions. We concluded that TSA induces apoptotic cell death of CD4+ T cells and reversible cell growth arrest. The induction of apoptosis of tumor cells by histone deacetylase inhibitors has been show to occur in several cases through a caspase-dependent mechanism including the conversion of the proenzyme form of a caspase to the catalytically active effector protease and concomitant up- or down-regulation of apoptosis regulatory proteins such as Daxx, bcl-xL, Bcl-2, Bid or Bad [18, 28–31]. Various authors have argued that inhibition of HDAC activity leads to chromatin relaxation and enhanced gene expression of, among others, specific cell-death regulating genes. However, this view has been questioned by several recent studies that suggest that histone hyperacetylation alone cannot account for all the cellular effects of deacetylase inhibitors [32–34] suggesting an additional mechanism(s) of action for HDACIs. To determine whether new transcription and protein synthesis are required for induction of apoptosis by TSA, we used the transcriptional inhibitor actinomycin D (act-D) and the protein synthesis inhibitor cycloheximide (CHX). Treatment of CD4+ T-cells with act-D and CHX effectively protected the cells from TSA-induced cell death with the graphic showing almost complete inhibition of TSA-induced apoptosis by CHX and act-D (Figure 2A), indicating that de novo mRNA and protein synthesis is required for TSA-induced apoptosis of CD4+ T-cells. TSA generates ROS and activates the caspase-dependent cell death pathway. (A) Effect of cycloheximide and actinomycin-D on TSA-induced apoptosis. CD4+ T-cells were pre-treated with either CHX or act-D for 1 h after which TSA was added to the culture medium at a final concentration of 100 nM. After 20 h, levels of apoptosis were assessed by PI staining. (B) Western blots showing the effect of TSA on levels of caspase-3 and -10. CD4+ T-cells were cultured for 20 h in the presence of medium containing growing concentrations of TSA or DMSO alone (-TSA). After 20 hours the cells were harvested and cell extracts prepared as described in the Materials and Methods section. Western blots were prepared using one of the following antibodies: caspase-3 (H-277), or caspase-10 p20 (H-131) from Santa Cruz Biotechnology, Inc. (USA). Reversible staining of blots with Ponceau S was used as loading and blotting control. A typical blot is shown. (C) Effect of TSA on cell death receptor expression. Spleen cells from C57BL/6 mice were cultured for 48 h in the presence of soluble anti-CD3 antibody (0.5 μg/ml), whereafter CD4+ T-cells were isolated by magnetic cell separation as described (materials and methods section). Cells were subsequently stimulated with immobilized anti-CD3 mAb or cultured in the presence of IL-2 (10 U/ml), harvested after 20 hours in the presence of various concentrations of TSA, and the levels of CD95 and CD95L analysed by flow cytometry. Inset in the upper right quadrant of each plot are the percentage of cells that gated to the various quadrants (UL – upper left; UR – upper right; LL – lower left; and LR – lower right). Logic quadrants were placed such that the cells in a non-stimulated sample gate to the LL quadrant. Only live cells are included in the analysis. (D) TSA induces ROS generation. 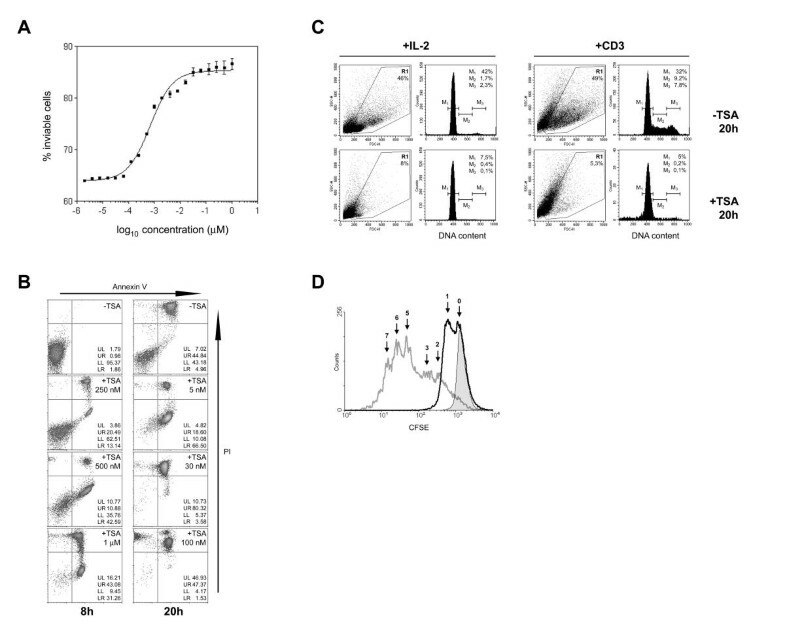 CD4+ T-cells were incubated for 24 h in the presence of medium containing IL-2 (10 U/ml), or anti-CD3 coupled beads (2:1 beads to cells ratio) after which either TSA (final concentration of 10 nM; bold black open histogram) or DMSO alone (black open histogram) was added. After 20 hours the cells were analysed for DHE and DCFDA fluorescence. (E) TSA-induced T-cell apoptosis can be inhibited by free radical scavengers and mitochondrial inhibitors. CD4+ T-cells were incubated for 24 h in the presence of medium containing IL-2 (10 U/ml), subsequently treated with SOD (2000 U/ml in the presence of 100 nM of digitonin), catalase (3000 U/ml), antimycin A (50 μM), or valinomycin (50 μM) for 1 h, after which TSA was added to the culture medium at growing concentrations. After 20 h, cells were harvested, and cell survival was determined by PI staining of nuclei. Shown are the mean percentage of survival; bars, SD. All data are representative of two independent experiments. A typical blot is shown. Trichostatin A has been shown to induce activity of effector caspases such as caspase 3 in Jurkat lymphoid, LIM 1215 colorectal cancer cell lines, and hepatoma cells HepG2, MH1C1, Hepa1-6 and Hep1B [35, 36]. Because TSA induced caspase-3 activity by more than 10-fold in Jurkat cells (a lymphoid cell line) we asked if this was also the case in primary lymphocytes. We saw no significant alteration in the levels of procaspase-3 or the active p20 and p11 caspase 3 fragments in CD4+ T-cells incubated for 20 h in the presence of medium containing growing concentrations of TSA (Figure 2B, upper panel). We also examined expression of an inducer caspase, caspase 10. We could detect an increase (5–6 fold) in the expression of procaspase-10 in TSA treated cells compared to control cultures (-TSA). Nevertheless, the levels of the active p20 fragment of caspase-10 remained largely unaltered (Figure 2B, lower panel) suggesting that TSA-mediated T-cell death is a caspase independent event. Exposure to M-carboxycinnamic acid bishydroxamide (CBHA), a recently developed hybrid polar compound and a potent inhibitor of HDAC activity, leads to apoptosis in human neuroblastoma cell lines, with a concomitant induction of expression of both CD95 (APO-1/Fas) and CD95 ligand (FasL) . Signals from members of the tumor necrosis factor receptor family, such as CD95/Fas, can result in apoptotic cell death. To ascertain if TSA up-regulates CD95/Fas and/or CD95L/FasL in T-cells thus leading to increased CD95/Fas-induced apoptosis, we examined the cell surface expression of these molecules in CD4+ T-cells, after exposure to growing concentrations of TSA for 20 hours (Figure 2C). Expression of CD95/Fas was decreased by TSA treatment both in cells stimulated with anti-CD3 and with IL-2. Thus, the percentage of IL-2-stimulated live cells showing high levels of CD95/Fas decreased from 3.72% in non-treated cells (-TSA) to 0.88% in cells treated with 100 nM TSA. In cells stimulated with anti-CD3 this decrease is even more noticeable, with the number of live cells displaying high levels of CD95/Fas decreasing from 22.54% in non-treated cells (-TSA) to 1.02% in TSA-treated cells (+TSA 100 nM). Conversely, expression of CD95L/FasL was increased by TSA treatment both in cells stimulated with anti-CD3 and with IL-2, with the percentage of IL-2-stimulated live cells that showed high levels of CD95L/FasL increasing from 0.72% in non-treated cells (-TSA) to 4.44% in cells treated with 100 nM TSA. In cells stimulated with anti-CD3 the number of live cells displaying high levels of CD95L/FasL increased from 1.78% in non-treated cells (-TSA) to 3.98% in TSA-treated cells (+TSA 100 nM). Interestingly, IL-2 stimulated cells displaying low levels of CD95L/FasL are depleted from the cell population by TSA treatment. Taken together, these results suggest that TSA-induced apoptotic cell death in T-cells cannot occur exclusively via activation of the Fas/FasL pathway, but that the observed up-regulation of CD95L expression might contribute to the apoptotic effect of TSA. One possible way the intrinsic cell death pathway can be activated is through cytochrome c release from mitochondria. Hence, mitochondria might in some way be involved in TSA-induced cell death. We decided therefore to investigate the role of mitochondria in CD4+ T-cell apoptosis by TSA. We tested the production of ROS by staining with the dyes DHE and DCFDA, which are oxidized to fluorescent products in the presence of superoxide and peroxides, respectively . TSA-treated CD4+ T-cells showed increased production of peroxides and superoxide (Figure 2D). Cells grown in the presence of TSA had a shift in the mean fluorescent value for DCFDA as well as DHE, showing that TSA induces production of peroxides and superoxide. As shown in Figure 2E, pre-treatment of CD4+ T-cells with several radical scavengers and mitochondrial respiration inhibitors significantly reduced TSA-induced apoptosis. Thus, antimycin A (a ubiquinol-cytochrome c reductase inhibitor), and valinomycin (a K+ ionophore, which dissipates the Δψm and interferes with electron transport) almost completely inhibited the apoptotic effect of TSA, whereas superoxide dismutase (SOD) and catalase, two free radical scavengers, partially inhibited the apoptotic effect of TSA (Figure 2E). These results show that the apoptotic effect of TSA in T-cells involves mitochondria and suggest a crucial role for mitochondrial respiratory chain (MRC) in TSA-induced apoptosis. Histone deacetylase inhibitors have been reported to suppress expression of cytokines in lymphocytes [19–21, 38]. We set out to determine if TSA could affect IL-2 production in normal primary T-cells stimulated in vitro under defined conditions. We subjected cells to a strong activating signal that induces them to produce high levels of IL-2 [24, 39]. Thus, CD4+ T-cells were stimulated with immobilized antibodies, either anti-CD3, or anti-CD28, or a combination of both (bead to cell ratio of 2:1). As expected, IL-2 was secreted by cells stimulated with immobilized anti-CD3 (~16 pg/ml IL-2) and anti-CD3+anti-CD28 (~37 pg/ml IL-2) but not with anti-CD28 alone or isotype control (trinitrophenol-specific hamster IgG) (Figure 3A). Cells treated with TSA (10 or 100 nM) showed a decrease in IL-2 levels of approximately 50–70%. Semi-quantitative RT-PCR analysis of CD4+ T-cells cultured in the presence of 100 nM TSA for 4, 8, and 20 hours, showed that the decrease in IL-2 production occurs at the transcriptional level, with levels of IL-2 mRNA declining by >50–60% already after 4 hours of exposure to 100 nM TSA (Figure 3B). After 8 hours, the levels of IL-2 mRNA are 5–6 fold lower in TSA-treated cells as compared to non-treated cells. And after cells have been cultured for 20 h in the presence of TSA, IL-2 expression is down to nearly undetectable levels. TSA represses IL-2 gene expression. Spleen cells from C57BL/6 mice were cultured for 48 h in the presence of soluble anti-CD3 antibody (0.5 μg/ml), whereafter CD4+ T-cells were isolated by magnetic cell separation as described in the materials and methods section. Cells were subsequently stimulated with the indicated immobilized antibodies and in the presence of the indicated inhibitors. (A) Inhibitors or DMSO alone (vehicle) were added to the medium – TSA (final concentration of 10 nM or 100 nM). After 8 hours the supernatant was harvested and IL-2 levels quantified by ELISA. (B) Purified CD4+ T-cells stimulated with immobilized anti-CD3 mAb were harvested after 4, 8, or 20 hours in the presence of 100 nM TSA, and levels of IL-2 mRNA quantified by relative RT-PCR as described (materials and methods section). Primers for 18S rRNA were used as control. (C) CD4+ T-cells stimulated with immobilized anti-CD3 mAb and cultured in growing concentrations of TSA were harvested after 8 hours and intracellular levels of IL-2 analysed by flow cytometry. Dead cells are excluded from the analysis. The data are representative of three independent experiments. To determine if the decrease we detected in IL-2 expression was due to a general decrease in expression or abrogation of expression in part of the cell population in TSA-treated samples, we performed single-cell analysis of intracellular levels of IL-2 by flow cytometry. As shown in Figure 3C, approximately 19% of live cells in the cell population produce high levels of IL-2 when stimulated with immobilized anti-CD3. This amount of IL-2 producing cells drops to 9.8% and 4.7%, when cells are exposed to 50 and 100 nM TSA, respectively. 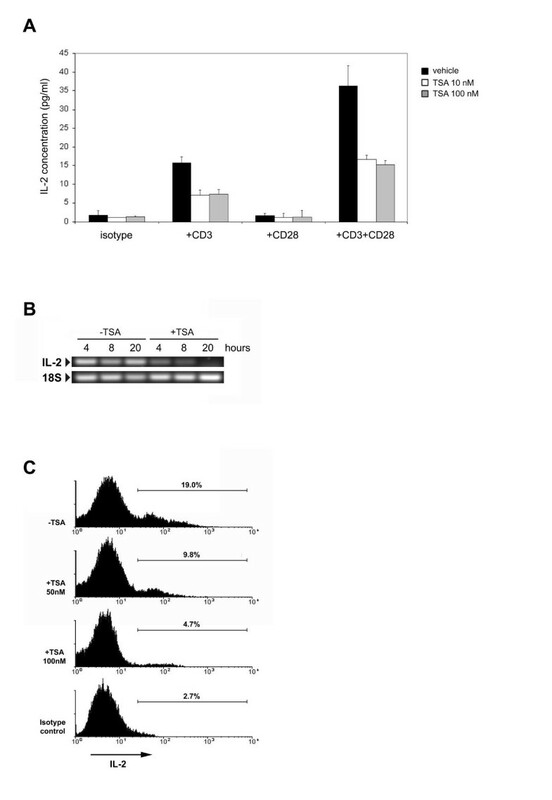 These data show that TSA specifically represses IL-2 expression in affected CD4+ T-cells. Chromatin-mediated repressive effects on gene transcription are usually ascribed to DNA methylation or histone deacetylation and several studies have shown that it is possible to pharmacologically revert some of these effects (40,41). Histone deacetylase inhibitors on the other hand are presumed to function by increasing histone acetylation and derepressing target genes. Nonetheless, TSA specifically affects IL-2 production in human leukemic Jurkat T cells, and decreases IL-2-mediated gene expression in IL-2-dependent cells [19, 26, 42]. Interestingly, HDAC inhibitors readily induce apoptosis in IL-2-dependent cells and transfectants expressing the IL-2 receptor c chain, but they show a far less apoptotic potential in cytokine-independent cells even though these inhibitors increase acetylation levels of histones to a similar degree in both cells . Given the biological role IL-2-mediated gene expression plays in cell survival, these data suggest that its repression may contribute to the apoptotic process induced by HDAC inhibitors. To test this possibility we looked at cell survival of CD4+ T-cells exposed to 100 nM TSA and cultured in the presence of growing concentrations of rmIL-2 (Figure 4A). Addition of rmIL-2 increased the survival potential of CD4+ T-cells, peaking at 10 U/ml after which a decline in cell survival ensues. This pattern is identical for TSA-treated or non-treated cells, showing that IL-2 cannot rescue the apoptosis induction by TSA in CD4+ T-cells. Nor can addition of several other survival cytokines, such as IL-4, IL-1α, and IL-12 (Figure 4B). 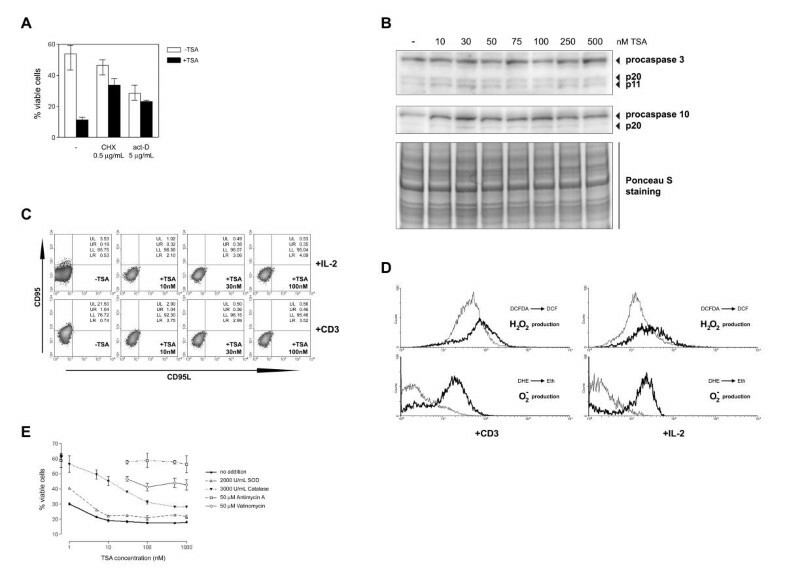 Strong activating stimuli such as co-immobilized antibodies against CD3 and CD28 (Figure 4B), phorbol esters (phorbol-12-myristate-13-acetate) in combination with ionophores (ionomycin), or lectins (concanavalin A), were also unable to rescue cells from TSA-induced apoptosis (data not shown). These results indicate that external stimuli, that normally induce proliferative or survival signalling pathways, cannot negate the apoptotic effect of TSA on CD4+ T-cells. Addition of exogenous cytokines does not rescue TSA-treated cells. (A) Effect of IL-2 on cell survival. 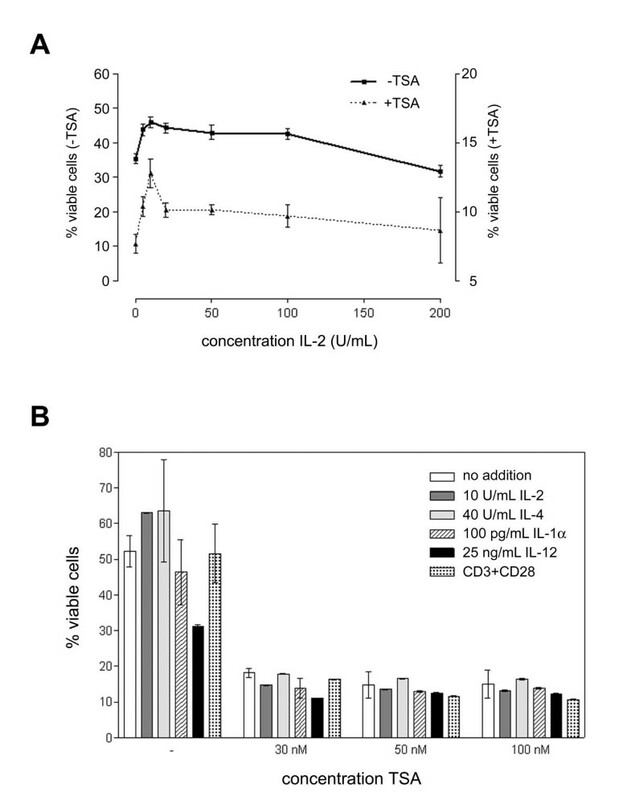 CD4+ T-cells were isolated by magnetic cell separation from C57BL/6 mouse splenocytes and cultured in medium containing 100 nM TSA (+TSA) or DMSO alone (-TSA) for 20 hours in the presence of growing concentrations of rmIL-2 (0–200 U/ml). Cell survival of TSA-treated cells is plotted in the right coordinates axis whereas that of non-treated cells is plotted in the left axis. (B) Effect of exogenous cytokine addition on cell survival. CD4+ T-cells were cultured in medium containing TSA at growing concentrations (+TSA) or DMSO alone (-TSA) and in the presence of various cytokines or stimuli (legend inset in graphic). PI staining of nuclei determined cell survival after 20 hours. Shown is the mean percentage of survival; bars represent SD. All data are representative of three independent experiments. The transcription factor NFκB is a crucial regulator of immune and inflammatory responses, controlling the expression of a plethora of genes including cytokine, cytokine receptor, chemokine, cell adhesion molecule, and other cell surface receptor genes [42, 43]. Members of the NFκB/Rel family of transcription factors, such as NFκB1 (p105/p50), NFκB2 (p100/p52), RelA/p65, RelB, and c-Rel, are predominantly located in the cytoplasm of unstimulated cells . Upon a variety of stimuli the inhibitory proteins known as IκB proteins, which bind NFκB proteins keeping them in a functionally inactive state, are specifically phosphorylated. This modification leads to ubiquitination and degradation of IκB by the 26S proteosome and results in nuclear translocation of NFκB and the activation of a variety of target genes . One such target is IL-2, suggesting that TSA might abrogate expression of this cytokine by inhibiting NFκB-mediated regulation. We investigated if decreased levels of nuclear NFκB mediate the effect TSA has on IL-2 expression. Western blot analysis of nuclear protein extracts of CD4+ T-cells exposed to growing concentrations of TSA shows a dose-dependent drop in the level of nuclear NFκB protein after stimulation with PMA/ionomycin (Figure 5A). Thus, cells treated with 100 nM TSA had 3–4 fold lower levels of nuclear NFκB protein as compared to control untreated cells (-TSA), suggesting that TSA inhibits nuclear translocation of NFκB. A recent report has shown that LPS-induced translocation of NFκB p65 from the cytoplasm to the nucleus in peripheral blood mononuclear cells (PBMCs) is inhibited by butyrate. This effect is apparently mediated by inhibition of IκB degradation . Consequently, we investigated if the TSA-mediated decrease in nuclear NFκB was due to inhibition of IκBα degradation. Western blot analysis of cytoplasmic CD4+ T-cell protein extracts showed a drastic drop in IκBα levels just 15 min after stimulation with PMA/ionomycin declining to even lower levels after 30 min, and maintaining a low level of expression thereafter (Figure 5A). This pattern was unaltered by TSA (Figure 5B). We concluded that TSA does not inhibit PMA/ionomycin-induced degradation of IκBα, and that the decrease in the levels of nuclear NFκB observed in TSA-treated cells occurs by some mechanism(s) other than inhibition of IκBα degradation. NFκB signalling is affected by TSA. (A) Effect of TSA on levels of nuclear NFκB. CD4+ T-cells were cultured with various concentrations of TSA (+TSA) or DMSO alone (-TSA) for 8 hours, whilst concomitantly stimulated with PMA+ionomycin (50 ng/ml and 1 μg/ml, respectively), or not stimulated (-PMA/ionomycin). Nuclear extracts were analysed for the presence of NFkB by western blot analysis using an antibody raised against NFκB p65 (C-20) (Santa Cruz Biotechnology, Inc. USA). (B) Effect of TSA on IκBα expression. CD4+ T-cells were pretreated with either 100 nM TSA (+TSA) or DMSO alone (-TSA) for 4 hours, whereafter phorbol-12-myristate-13-acetate (PMA; 50 ng/ml) and ionomycin (1 μg/ml), or vehicle (-PMA/ionomycin) was added to the medium and the cells were cultured for various periods of time. 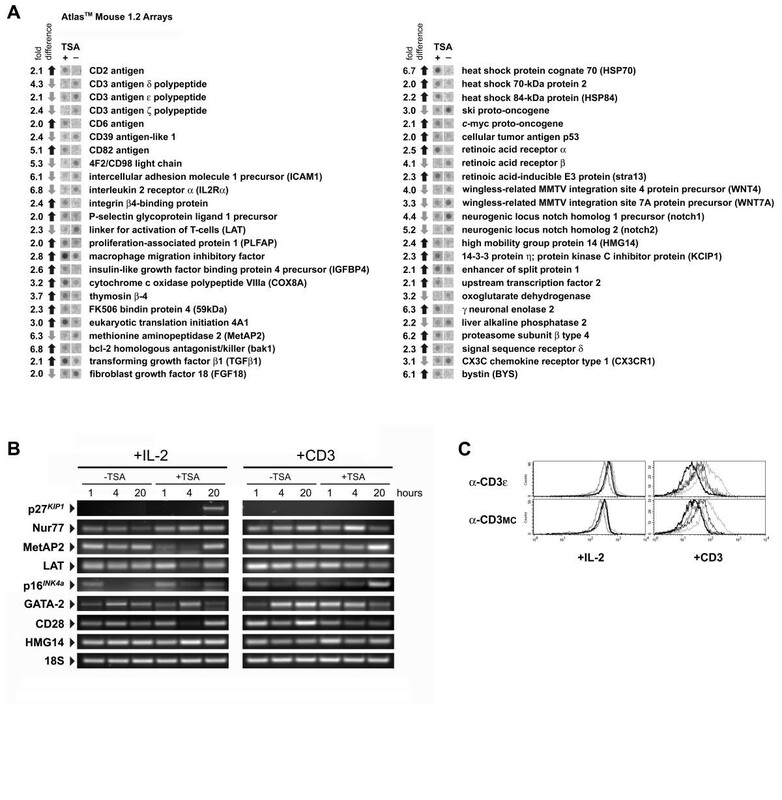 Cell lysates were analysed for IκBα expression by Western blot analysis using an anti-IκBα antibody from Cell Signaling Technology (CST, Beverly, MA). Reversible staining of blots with Ponceau S was used as loading and blotting control. Recent studies have demonstrated that HDACIs can modulate expression of several costimulatory/adhesion molecules not only in cell lines but also in clinical samples [21, 23]. Since adequate expression of costimulatory/adhesion molecules is essential for proper T-cell responses, be it cell survival, activation or proliferation [47–50], we decided to analyze the expression levels of various cytokine receptors, cell adhesion molecules, and cell surface receptors in a cell population treated with TSA. Splenocytes from C57BL/6 mice were stimulated with soluble anti-CD3 antibody (0.5 μg/ml) or IL-2 (10 U/ml) and exposed to 100 nM TSA. Samples were taken after 4 and 20 hours, and expression of cell surface markers examined by flow cytometry (Figure 6A). CD4+ T-cells stimulated with IL-2 and exposed to TSA for 4 hours, exhibited lower levels of expression of CD11c, CD69, CD28, CD40, and CD40L, and higher levels of expression of IL2Rβ with all others remaining constant. After 20 hours of exposure IL2Rβ, ICAM-1, CD8a, CD11c, CD45RB, CD69, CD28, CD40L, CD80, CD86 and CD95 were downregulated to various extents, but none of the examined molecules was upregulated. In non-CD4 cells stimulated with IL-2 and exposed to TSA for 4 hours, the pattern of effects was very similar. Thus, expression of CD11c, CD69, CD28, CD40, and CD40L was downregulated, whereas expression of IL2Rβ was increased. After 20 hours of exposure, IL2Rα, IL2Rβ, LFA-1, ICAM-1, CD8a, CD11b, CD11c, CD45RB, CD69, CD28, CD40, CD40L, CD48, CD86, and CD95 were downregulated to various extents, but of the examined molecules only CD80 was upregulated. Stimulation of PBMCs with anti-CD3 led to profound alterations in the profile of TSA-mediated cell surface molecule expression. CD4+ T-cells exposed to TSA for 4 hours, exhibited higher levels of expression of CD11c and ICAM-1 with all others remaining constant. After 20 hours of exposure, IL2Rα, IL2Rβ, LFA-1, CD45RB, CD28, CD40, CD40L, and CD48 were downregulated, whereas ICAM-1 and CD69 were upregulated. In non-CD4 cells treated with TSA for 4 hours levels of expression of CD11c were increased. After 20 hours of exposure, IL2Rα, IL2Rβ, LFA-1, ICAM-1, CD8a, CD11c, CD28, CD40L, and CD95 were downregulated, and CD11b, CD40, and CD86 were upregulated. These results demonstrate that HDAC inhibitors may modulate T-cell function in part through changes in the expression of cell surface proteins. TSA modulates expression of cell surface molecules. (A) PBMCs from C57BL/6 mice were cultured in the presence of soluble anti-CD3 antibody (0.5 μg/ml) or IL-2 (10 U/ml) and exposed to 100 nM TSA for 4 hours (open black histogram) and 20 hours (open blue histogram), or to DMSO alone for 4 hours (open red histogram) or 20 hours (open brown histogram). Cells were harvested, extensively washed, and flow cytometric analysis of cell surface molecules performed as described in the materials and methods section. Dead cells are excluded from the analysis. (B) PBMCs from C57BL/6 mice were cultured in the presence of soluble anti-CD3 antibody (0.5 μg/ml) or IL-2 (10 U/ml) and exposed to 100 nM TSA or to DMSO alone for 20 hours. Cells were harvested, stained with a PE-conjugated anti-CD4 antibody and analysed by flow cytometry. PI staining of nuclei assessed cell viability. Shown are the mean percentage of survival; bars, SD. The data are representative of three independent experiments. The differences in expression of cell surface molecules, such as CD95/Fas, in PBMCs in the two cell subpopulations we examined (CD4+ T-cells versus non-CD4 cells) suggested to us that the various cell types might be affected to different extents by TSA. To clarify this point, we cultured PBMCs in the presence of either soluble anti-CD3 antibody (+CD3) or IL-2 (+IL-2) and treated with TSA (+TSA) or DMSO for 20 hours. Subsequently, cells were analyzed by flow cytometry to determine cell viability and the ratio of CD4+ T-cells versus non-CD4 cells. Plotting of the percentage of total viable cells in the population shows that TSA induces apoptosis in PBMCs to a similar extent in anti-CD3 or IL-2 stimulated cells (Figure 6B; leftmost bar set). Correspondingly, plotting the percentage of live CD4+ T-cells in the total cell population reveals that TSA induces apoptosis in CD4+ T-cells to a similar extent in anti-CD3 or IL-2 stimulated cells (Figure 6B, middle bar set). However, plotting the number of CD4+ T-cells as a percentage of the viable cell population shows an interesting effect of TSA. Whereas in the IL-2 stimulated control cell population roughly 22% of the viable cells are CD4+ T-cells, in the TSA-treated cell population almost 41% of the viable cells are CD4+ T-cells (Figure 6B; rightmost bar set). The opposite is true in anti-CD3-stimulated cells, where the percentage of CD4+ T-cells decreases from 38% in non-treated cells to 28% in TSA-treated cells. We interpreted these data to reflect the abrogation of IL-2 expression caused by TSA. Exogenously added IL-2 keeps preferentially CD4+ T-cells alive, an effect that becomes very significant in the presence of TSA. On the other hand, anti-CD3 alone induces cell death in CD4+ T-cells, an effect that is exacerbated in the presence of TSA given the lack of production of endogenous IL-2 by activated CD4+ T-cells. To examine the differential patterns of gene expression resulting from TSA treatment, we used high-density expression arrays from Clontech (Atlas™ mouse 1.2 and 1.2 II). In order to minimize variations in gene expression unrelated to the treatment with TSA, we decided to use a more uniform T cell population, specifically, naïve CD4+ CD62L+ CD44low cells. Figure 7A shows a list of the genes that were reproducibly affected after 4 hours of treatment with 100 nM TSA. Out of the 2352 genes examined only 48 showed significant (>2-fold variation) and reproducible (less than 20% variation in two independent mRNA preparations) changes in levels of expression in cells treated with TSA. This corresponds to approximately 2% of the examined genes showing that TSA acts rather selectively on gene expression in CD4+ T cells. Transcriptional regulation of various genes by TSA (A) Gene expression profile of TSA-treated and non-treated CD4+ T-cells. Naïve CD4+ CD62L+ CD44low cells were isolated from C57BL/6 spleen cell preparations, cultured in the presence of IL-2 (10 U/ml) for 24 hours and Atlas Mouse cDNA Expression Arrays were used to analyse the differential gene expression caused by exposure of these cells to 100 nM TSA for 4 hours. Shown are all genes that varied in expression by greater than 2-fold in all experiments. Upward black arrows indicate upregulated genes, downward grey arrows denote downregulated genes. Data are based on two independent preparations of mRNA, for each experiment. Two membranes were used per sample. (B) Verification of several of the genes affected by TSA by semi-quantitative RT-PCR analysis. CD4+ T-cells were isolated by magnetic cell separation from pre-activated splenocytes (48 h in the presence of soluble anti-CD3 antibody). Cells were then stimulated with immobilized anti-CD3 mAb or cultured in the presence of IL-2 (10 U/ml), and harvested after 1, 4, or 20 hours in the presence of 100 nM TSA. Expression of 18S rRNA was used as normalizing control (C) Flow cytometric analysis of CD3ε and CD3 MC (molecular complex) expression in CD4+ T-cells exposed to TSA. CD4+ T-cells were cultured in the presence of immobilized anti-CD3 antibody (2:1 beads to cells ratio) or IL-2 (10 U/ml) and exposed to 100 nM TSA for 4 hours (open black histogram) and 20 hours (bold open black histogram), or to DMSO alone for 4 hours (open grey histogram) or 20 hours (open bold grey histogram). Data are representative of three independent experiments. To verify the changes in transcription detected by our microarray analysis, we performed semi-quantitative RT-PCR analysis on selected TSA responsive genes. We chose a subset of genes revealed by our microarray analysis to be HDAC-dependent (MetAP2, LAT, and HMG14) as well as a subset of genes not identified in our analysis and shown to have HDAC-dependent transcriptional regulation (Nur77, CD28, GATA-2, p27Kip1, and p16/Ink4a/Arf). The time-dependency in the TSA-mediated effects, which we had observed in the expression of cell surface molecules (Figure 6B), prompted us to perform the RT-PCR analysis at various time points (1, 4, and 20 hours of treatment with TSA). Various genes exhibited a heterogeneous behavior with a time and stimulus dependency. Thus, levels of p27Kip1 (a cyclin-dependent kinase inhibitor) were drastically increased after 20 hours of treatment with TSA in IL-2 stimulated cells but not in anti-CD3 stimulated cells. Expression of Nur77 (an orphan member of the nuclear hormone receptor superfamily) was upregulated in IL-2 stimulated cells both after 4 and 20 hours, but it was upregulated after 4 hours and downregulated after 20 hours in anti-CD3 stimulated cells. Levels of MetAP2 mRNA (methionine aminopeptidase 2) were decreased already after 1 hour of exposure to TSA in IL-2 stimulated cells and returned to normal levels after 20 hours. In anti-CD3 stimulated cells MetAP2 was downregulated after 1 and 4 hours of exposure to TSA and was upregulated after 20 hours. Expression of LAT (linker for activation of T cells) was decreased after 4 hours of treatment with TSA in IL-2 stimulated cells, returning to normal thereafter. In anti-CD3 stimulated cells however, levels of LAT decreased already after 1 hour of exposure to TSA and remained lower than in normal control cells up to 20 hours of exposure to TSA. Levels of expression of the tumor suppressor gene p16Ink4a were upregulated after 4 and 20 hours of treatment with TSA in IL-2 stimulated cells but were essentially unaltered in anti-CD3 stimulated cells. GATA-2, a zinc finger family transcription factor, was upregulated in IL-2 stimulated cells after 4 hours of exposure to TSA but downregulated after 20 hours. In anti-CD3 stimulated cells expression of GATA-2 was upregulated after 1 hour of treatment with TSA and downregulated after 20 hours. Expression of CD28 (a costimulatory molecule important for T cell activation) was downregulated in both IL-2 and anti-CD3 stimulated cells after 4 hours of exposure to TSA, but remained so only in anti-CD3 stimulated cells after 20 hours. On the other hand, upregulation of HMG14 (chromosomal protein) by TSA can only be observed in IL-2 stimulated cells after 4 hours, remaining normal in anti-CD3 stimulated cells. These data confirm the results obtained with the microarray analysis and additionally show that the effects of TSA are time and stimulus dependent. One of the most consistent effects we observed with the microarray analysis was the downregulation of several subunits of the T cell receptor associated CD3 complex (Figure 7A). Several subunits of this complex including the ε chain are transcriptionally downregulated by TSA treatment. To confirm this result and to determine how the transcriptional effects translate into differences in protein expression and consequently functional effects, we analyzed by flow cytometry the surface expression of the CD3 molecular complex and CD3ε chain in IL-2 and anti-CD3 stimulated CD4+ T cells, upon exposure to TSA for 4 and 20 hours (Figure 7C). As could be expected from the microarray results, surface expression of CD3 decreased in IL-2 stimulated cells after 20 hours and in anti-CD3 stimulated after 4 and 20 hours exposure to TSA. These results indicate that transcriptional modulation of genes by TSA correlates into expression differences of molecules and presumably into functional effects. Remodelling of chromatin structure of promoters is a key mechanism in the regulation of gene expression in eukaryotes. The pathogenic role of aberrant patterns of gene expression in neoplastic transformation of cells makes the HAT/HDAC enzymatic system an obvious target for therapeutic intervention. Even more so as several reports link HAT/HDAC activity to cancer [51–53]. Culturing of transformed cells in the presence of HDACIs invariably leads to cell growth inhibition, and/or apoptotic cell death, and in rodent models of cancer HDACIs can significantly reduce the growth of tumors. Interestingly, administration of several HDACIs at pharmacologically relevant doses shows no side effects, even on embryonic development [16, 54, 55], a notable lack of toxic effects from a class of anti-tumor drugs that induces cell death and proliferation arrest in cultured cells. One recent report provides an important clue as to the reason of this differential effect; namely that normal cells are less sensitive to HDAC inhibition than transformed counterparts . However, non-transformed cells are also affected by HDACIs and some reports have shown that T cells are affected by HDACIs [21, 38]. To try to understand the mechanism(s) of preferential sensitivity of cancer cells to HDAC inhibition and to determine if normal cells might be affected by HDACIs to an extent that would block their normal biological role, we decided to investigate the effects of TSA on normal primary T cells using a murine model system. TSA is a first generation pharmacological compound, which in a reversible and highly specific manner inhibits histone deacetylases at nanomolar concentrations. The high potency and specificity of this drug makes it a prototype compound and a very useful tool for studying the effects of HDACIs. In this study we show that TSA induces a reversible G1 cell cycle block, and apoptosis of proliferating T lymphocytes in a similar way to its effect on tumor cells (Figure 1; panels A, B, C, and D) and at similar concentrations. Apoptosis is a strongly regulated molecular event with two main pathways leading to apoptotic cell death. One pathway involves interaction of a death receptor, such as the TNF- or Fas-receptors with their respective ligands, and the second is mitochondria-dependent. The end result of either pathway is the activation of the caspase cascade and the proteolytic processing of specific cellular substrates, resulting in apoptotic cell death [56, 57]. Here we demonstrate that the ability of TSA to induce cell death is dependent upon de novo mRNA and protein synthesis (Figure 2B) and intact mitochondrial function (Figure 2D). Induction of cell-death by TSA is apparently not initiated through activation of the caspase cascade (Figure 2C) but rather by production of reactive oxygen species (Figure 2E). Mitochondrial membrane damage seems to be an important proapoptotic event in TSA-mediated T-cell death as free radical scavengers and mitochondrial respiration inhibitors significantly reduced TSA-induced cytotoxicity (Figure 2F). In at least one reported situation, HDACIs can also induce death receptor-mediated apoptotic cell death . This however, is apparently not the case with TSA-induced T-cell death. In TSA-treated T cells the levels of CD95 actually decrease, concomitant with cell growth arrest, while the levels of CD95L increase only very modestly (Figure 2D). Activation of the caspase pathway and production of ROS in tumor cells has also been reported for other HDACIs [13, 28, 30], suggesting that HDACIs-specific alterations in gene expression result in the generation of ROS and/or activation of the caspase cascade with ensuing cell death. But if production of ROS and caspase activation in response to transcriptional events is a general cellular response to HDAC inhibition why the preferential sensitivity of tumor cells? One possibility is that a crucial subset of genes has to be deregulated for cell death to occur. In many cases, inhibition of cell growth by HDACIs has been accompanied by transcriptional upregulation of the cyclin-dependent inhibitors p27 kip1 and p21 cip1 , leading to the suggestion that these two genes might be key mediators of the HDACIs antiproliferative action. However, mouse embryo fibroblasts deficient in both p27 kip1 and p21 cip1 are also susceptible to cell cycle arrest by TSA . Furthermore, there are several reports of synergistic interactions between HDACIs and other compounds leading to apoptotic cell death in conditions where neither per se would have an effect [36, 59]. These data indicate that unlike other pharmacological agents whose effects are dependent on targeting one key gene, or enzymatic activity, HDACIs affect several functionally unrelated genes simultaneously, with the outcome being dependent on the sum of cellular effects caused by the affected genes in a given tissue or cell-type. In this study we demonstrate that exposure of CD4+ T-cells to TSA decreases IL-2 mRNA levels (Figure 3B) abrogating IL-2 production (Figures 3A and 3C). Abrogation of IL-2 production could contribute to induction of T-cell death by HDAC inhibitors through IL-2 deprivation-induced apoptosis. However, exogenous addition of IL-2 does not significantly affect T-cell survival upon treatment with TSA (Figure 4A), and neither does addition of other cytokines (Figure 4B). These data indicate that the apoptotic pathway induced by TSA cannot be rescued by external stimuli such as cytokines, and activation signals such as anti-CD3 and anti-CD28 (Figure 4B). Lymphocytes are typically exposed to various extracellular stimuli such as growth factors and cytokines that activate both cell survival and apoptotic pathways. NF-κB is a central transcription factor in these responses [43, 60, 61]. Translocation of NFκB p65 from the cytoplasm to the nucleus in PBMCs is inhibited by butyrate, an effect apparently mediated by inhibition of IκB degradation . We examined the degradation pattern of IκBα in response to a strong activation stimulus (PMA+ionomycin) in T-cells that had been exposed to TSA (Figure 5B) and could not observe an inhibitory effect of TSA on IκBα degradation. Notwithstanding, the nuclei of CD4+ T-cells treated with TSA displayed significantly lower levels of NFκB as compared to a control population (Figure 5A). Consequently, HDAC inhibition by TSA affects NFκB signaling but not through an effect on IκBα degradation, indicating that another mechanism is responsible for this effect. Interestingly, a recent study showed that the p65 subunit of NFκB is subject to acetylation by both p300 and PCAF and can interact with HDAC2 and HDAC3 . Furthermore, the authors show that acetylation reduces binding of p65 to κB-containing DNA, facilitating its removal by IκBα and subsequent export to the cytoplasm. Thus, higher levels of acetylation of p65 due to HDAC inhibition would probably result in increased nuclear export and reduced binding affinity for cognate sites. The pivotal role played by NFκB in T-cell survival and apoptosis suggests this transcription factor to be a mediator of TSA-induced T cell death, and potentially of other effects on gene expression as well. Expression of a number of adhesion/costimulatory molecules is deregulated by TSA treatment. As shown in Figure 6A, TSA affects expression of several markers not only in CD4+ T-cells (Figure 6A; CD4+ T-cell) but also in other lymphoid cells (Figure 6A; non-CD4). Interestingly, these effects are extremely diverse in amplitude, time frame and cell type. Hence, expression of the IL-2 receptor β chain (IL-2Rβ) is upregulated by TSA after 4 hours of treatment in CD4+ T-cells and non-CD4 cells if the cells are cultured in the presence of IL-2, but not if the cells are stimulated with anti-CD3 antibody. Conversely, after 20 hours of treatment with TSA expression of IL-2Rβ is downregulated both in CD4+ T-cells and non-CD4 cells. Other costimulatory molecules such as CD28 and CD80 are downregulated by TSA independently of cell type, but in a stimulus dependent manner, in that their expression is not affected in cells stimulated with anti-CD3 antibody but declines in the presence of IL-2. Other molecules are affected only in a given set of conditions. One such case is the expression of CD95/Fas. Expression of this cell surface receptor is essentially unaffected by TSA in cells stimulated with anti-CD3 antibody (either CD4+ T-cells or non-CD4 cells) independently of time. However, after 20 hours of exposure to TSA, IL-2 stimulated cells show down-regulation of CD95/Fas with non-CD4 cells being the most affected. One consequence of this differential sensitivity is that exposure to TSA skews the composition of a cell population, with different subpopulations being affected to different extents (Figure 6B). A recent study on the effects of TSA in primary murine macrophages showed that TSA inhibits CD9 protein and message expression, resulting in a modest increase or no effect on CD54 and CD11b, respectively . In short, TSA can up- as well as down-regulate expression of cell surface molecules, and it does so in a time-, cell type- and stimulus-dependent manner. To further characterize the mechanism by which TSA exerts its effects, we performed gene expression profiling of 2352 known genes employing microarrays (Atlas mouse 1.2 and 1.2 II; CLONTECH Laboratories, Inc.) and show that genes involved in generating a full T-cell response are affected by TSA (Figure 7A). Some of the genes we identified in this manner are known targets for HDACs, validating them as bona fide targets of TSA-mediated HDAC inhibition in T cells. That is the case of Hsp70, notch1 and 2, RARα, RARβ, and Stra13, among others [55, 64, 65]. Additionally, many of the genes deregulated by TSA play a crucial role in immune regulation. That is the case of Notch-1 (important in controlling levels of cell death in T cells); stra13 (a transcriptional repressor associated with cell cycle progression and cell growth); TGFβ1 (a cytokine involved in modulation of immune responses); ICAM1 (adhesion molecule, can induce T cell proliferation). It is also noteworthy that we identified a TSA-responding subset of 48 genes out of a total of 2352 genes examined, which corresponds to roughly 2% of the examined genes being affected by TSA. Several studies have reported a similar figure (~2%) for other HDACIs and cell types [10, 11] demonstrating the specificity of effects exerted by HDACIs. A time course RT-PCR analysis of several gene targets shows that some effects of TSA are transient (LAT; Figure 7B – IL-2 stimulated cells) others are stimulus dependent (HMG14, MetAP2; Figure 7B – IL-2 versus anti-CD3) underscoring the regulatory complexity of chromatin structure-mediated gene regulation. In peripheral blood mononuclear cells (PBMCs), activation by PHA, PMA and anti-CD3 increases HDAC mRNA levels suggesting that HDACs are involved in cell cycle progression and activation . We show in this study that TSA affects many genes involved in generating a full T cell response and that the effects of TSA on T-cells are predominantly immunosuppressive indicating that HDACIs may represent a novel approach to the control of inflammation. Remodelling of chromatin structure of promoters is a key mechanism in the regulation of gene expression in eukaryotes. The pathogenic role of aberrant patterns of gene expression in neoplastic transformation of cells makes the HAT/HDAC enzymatic system an obvious target for therapeutic intervention. Even more so as several reports link HAT/HDAC activity to cancer. Due to their growth-inhibiting and differentiation-inducing properties, HDACIs are the object of intensive research. The remarkable tumor specificity of these compounds together with strikingly few side effects contribute to make HDACIs an exciting new therapeutic approach to cancer. One recent report provides an important clue as to the reason of this differential effect; namely that normal cells are less sensitive to HDAC inhibition than transformed counterparts. But several problems still need to be addressed and a number of discrepant observations clarified. Experiments with HDACIs in animal model systems support a preferential effect of these drugs on tumor cells but do not exclude the possibility that particularly sensitive non-malignant cell types might exist. Our results clearly demonstrate that normal primary CD4+ T cells are sensitive to HDACIs. The cytotoxic effect of TSA was dose dependent and dependent on the generation of reactive oxygen species. We also demonstrate that various cellular functions, such as proliferation and cytokine production, were inhibited when T cells were exposed to TSA. Interestingly, expression of a subset of genes involved in T cell responses, including a variety of costimulatory/adhesion molecules, was reduced in cells treated with TSA. Briefly, our findings show that HDACIs have a strong immunomodulatory potential that may contribute to the potency and specificity of these antineoplastic compounds and suggest that the immunosuppressive vs. increased tumor immunity effect of HDACIs might be important for targeting tumor cell proliferation and survival, which may impinge on the future clinical use of these drugs. Another aim of our study was to evaluate the cellular mechanisms by which HDACIs function, the current view being that HDAC inhibitors, such as Trichostatin A (TSA), induce hyperacetylation of core histones modulating chromatin structure and affecting gene expression. Even so, global histone hyperacetylation does not lead to a generalized increase in transcription but rather to deregulation of a limited set of, suggesting that chromatin structure modulation by HDACs is a gene-specific event with a variable transcriptional outcome, and that only a few genes (approximately 2%) are regulated primarily through HDAC-dependent mechanisms. Even though several genes modulated by HDAC inhibition have been identified, those genes clearly responsible for the biological effects of these drugs have remained elusive. Our microarray analysis of T-cells exposed to TSA showed that about 2% of the examined genes were deregulated. Interestingly, the extent of the effects caused by TSA varied with time and the stimuli applied to cells, indicating that a complex set of interactions is at work. But if only a limited number of genes are deregulated by HDACIs, with no single gene being incontrovertibly responsible for the compound's biological effects, how can one explain the myriad of cellular effects that histone deacetylase inhibitors can bring about? The answer might be that a misleading notion is the culprit for the elusiveness of the mechanism of action of HDACIs. Originally identified as the enzymes responsible for the removal of acetyl groups from histones, histone deacetylases have remained known as such even though we now know that they can function as deacetylase activities on proteins other than histones. An emerging body of literature supports a role for acetylation in regulating protein function and several proteins, including many with cancer relevance such as p53, NF-κB, c-Myb, PR, GATA-1, E2F-1, -2, and -3, have been identified as targets for acetylases. Thus, modulation of protein function by acetylation might be one of the primary molecular mechanisms by which HDACIs exert their biological effects. One could then envision the physiological and therapeutic effects of these compounds as the end-result of their combined biological effects. Blocking deacetylase(s) activity will not only result in global histone hyperacetylation and concomitant transcriptional derepression but also lead to increased acetylation of non-histone proteins. These can be transcription factors such as p53 and NF-κB, structural proteins like tubulin, or any other type of protein. Increased acetylation of these proteins will result in altered activity (e.g. localisation of nuclear NF-κB is dependent on acetylation levels) and consequently in an altered biological state. Effects resultant from altered protein function in addition to those resulting from global hyperacetylation and derepression of gene expression, adds a new level of complexity to the mechanism(s) of action of HDACIs and explains several answered questions that the simpler histone-only model could not easily explain. J.M.A. Moreira contributed to the design of the study, planned and performed the laboratory work and data analysis, and drafted the manuscript; P. Scheipers and P. Sørensen participated in the conception, supervision, coordination and guidance of the study and manuscript preparation. All authors read and approved the final manuscript. We are grateful to the staff of the ABR animal house facility, and especially Sara Larsson, for their help with animal care, husbandry, and sample procurement.